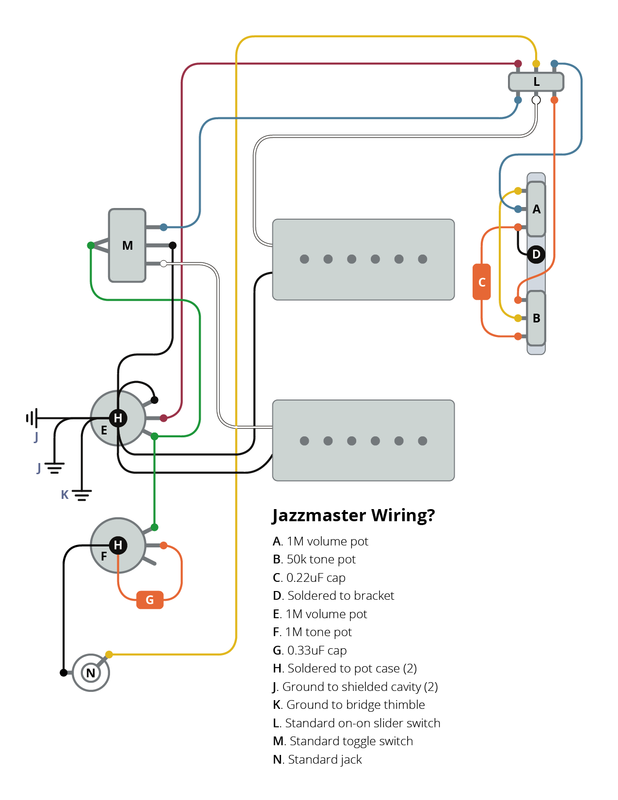 Jazzmaster wiring—what am I doing wrong? Hi all, I am attempting to wire up a Squier VM Jazzmaster, following these instructions, and using this wiring kit with some Bootstrap Lake Surfers. I got the guitar secondhand, and the previous owner made some creative wiring mods. I'm just trying to bring it back to spec. I redrew the wiring diagram (below) for two reasons: to get a handle on where everything goes, and to map out the grounding. It's now wired according to this diagram. The rhythm circuit works fine, but three-way pickup switch doesn't seem to do anything. Assuming the solder joints are ok, what did I do wrong? Last edited by Sitcomsolution on Mon Apr 15, 2019 6:20 pm, edited 2 times in total. Re: Jazzmaster wiring—what am I doing wrong? It looks to me that the 3-way is connected incorrectly. The output should be 2 terminals joined together, the ground should be the thick centre one on its own. I think you have them swapped. Posting the updated diagram in case someone stumbles on this post. BTW which software did you use for your diagram ? Without wanting to be a pain in the arse, anyone have a diagram for 2 wide range HBs, with a 3 way switch, tone and vol for my first jazzy build? That's about as straightforward as it gets. WRHBs don't need anything different to normal HBs. There have been different generation WRHBs and I am not sure if they all had the stock Fender 2-wire HB colour code .. but with only 2 wires you can't really run into trouble. The other coil wires should already be tied together (similar to on the SD diagram). Original WRHBs were often paired with 1meg pots. Reissues more likely to go with 500k. I didn’t think to do that. I did shield the entire pickguard. Would that have the same effect? Edit: the drawing was made in Adobe Illustrator, just because it was handy. The circuit uses the fact that the bracket is grounded, ie to ground one leg of the tone capacitor. So it won't work properly if the bracket is not grounded. But it doesn't matter how it is grounded, just that it is. Most Fender wiring runs a ground wire to the bracket. But if the bracket is in contact with pickguard shielding, and that is grounded (as it should be), then you are OK. You can check with a multimeter (without opening it up) by looking for continuity (~0 ohms) between the rim of the output socket and the bracket screw on the pickguard.